We are leader supplier of All types of fittings. Hym Brothers Analytical Solutions Pvt. Ltd.
Brass Angled Capillary Dimension / Length / Size: : Begins from 1/2 x 15mm Female and up to any size as per Custom Designs and requirements. We offer wide range of Packed and Capillary Columns of Different Barnd used for Gas Chromatography Analysis. We offers a wide range of Capillary Columns. It is the polyimide coating that is primarily responsible for the notorious flexibility of the capillary column. All these are available at industrial leading prices. Backed by a team of skilled, experienced and dedicated professionals we are offering a premium quality gamut of GC Capillary Ferrules. The offered range of GC Capillary Ferrules is manufactured using high grade raw material procured from reliable vendors of the market in compliance to set industrial quality norms and standards. 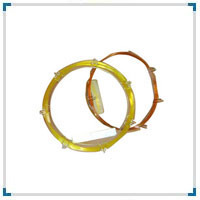 Fused Silica Capillary Column are produced with the industry standard polyimide outer coating (390° c maximum temperature) for most general GC applications. Columns with high temperature polyimide coatings, for applications 400° C, are available upon request. Supported ourselves with proficient amenities, we are readily instrumental in providing an inclusive variety of GC Capillary Column Nuts. We are amongst the top company in this domain offering Capillary Columns. We provide them in numerous specifications keeping in view the diversified needs of our clients. These services are improved with modern technologies and are abrasion resistant in nature. Damage proof in nature, these Capillary Columns are best in finishing and easier to install in chromatography units. Reliable in nature, these columns are perfectly made under the guidance of experts. Professionals make these capillary products very carefully and use best quality material to bring premium quality.